Over the years, I have received a lot of questions asking what is the best paint for glass, ceramics and metal. It’s a popular question because there are so many paints out there that just don’t really work, stick or look all that great. Many of the specialty glass/ceramic paints are either too translucent or streak. Usually when I hear from people, they have already tried several products and were unhappy with the result. I thought today I would answer that question by sharing an easy DIY gift idea as an example of the paints that I have used for years because it’s absolutely amazing. As you read this post, keep in mind that you can use these paints and the technique I’m showing you on virtually anything and it will stick, last forever and look gorgeous! 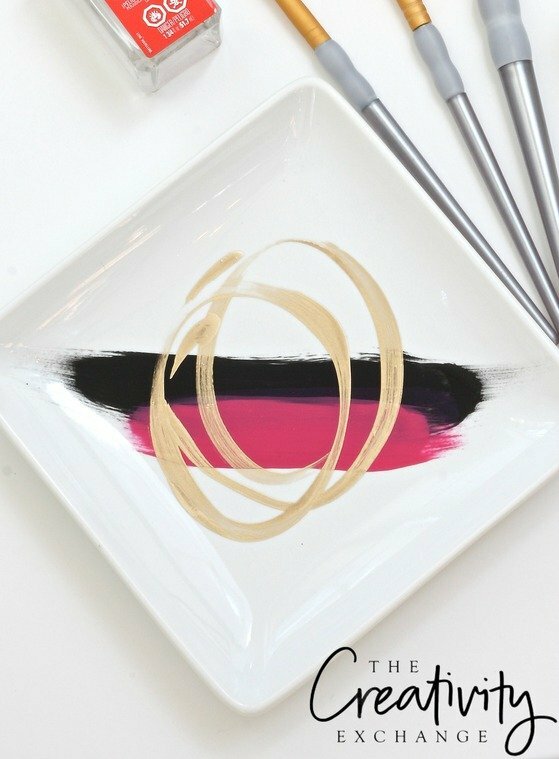 For today’s project, I just painted some colorful small square plates from Target here for fun gifts for my girlfriends to use as a ring/jewelry tray of on their desks for paper clips and other supplies. I’m also sharing a little trick for getting those pretty paint swipes for that you can do on any type of paint project. Testor’s and Model Masters are the same company and the Model Masters is just a bigger bottle. The Testor’s are glass bottles that are really small and inexpensive ($2.99) and they are the perfect amount for projects like this. Because these paints are made for model cars, they are extremely durable and the finish is very opaque and stunning. Their color selection is awesome and you can always mix colors too in a small disposable cup (like a Dixie Cup) if they do not have the color you’re looking for. **Here is the one thing you need to know about all enamel paints- they have to dry and cure for at least 5-7 days. While the paint may be dried to the touch, all oil based enamels have to fully cure otherwise, the paint will just scratch right off. You do not have to “bake” these paints like other ceramic/glass paints, you just need to wait until the cure. Anytime you are going to paint glass, ceramics or metal with enamel paints, you’ll need to wipe the area you’re going to paint well with alcohol. Enamel paint will not firmly adhere to any surfaces that may have any kind of residue from natural oils from our hands to waxes and other surface residue. Once you wipe the area, it will need to completely dry. You will need to have a paint brush or a set of brushes in different sizes that say that they can be used for enamels/stains or oil-based paints. I love to use this 3 pc. filbert set from Royal Crafters for this type of project. It makes such a difference in the type of brush you use for painting these types of projects and filbert brushes work the best for enamels and the paint goes on extra smooth with them. I recommend practicing this on paper or poster board first. You will need to let your first paint swipe or first layer dry about an hour until you go over your paint with another layer. You can speed it up by putting a fan on it. You will need to do this for every layer otherwise, your layers will smudge. Again, you’ll want to practice this first on paper or poster board. 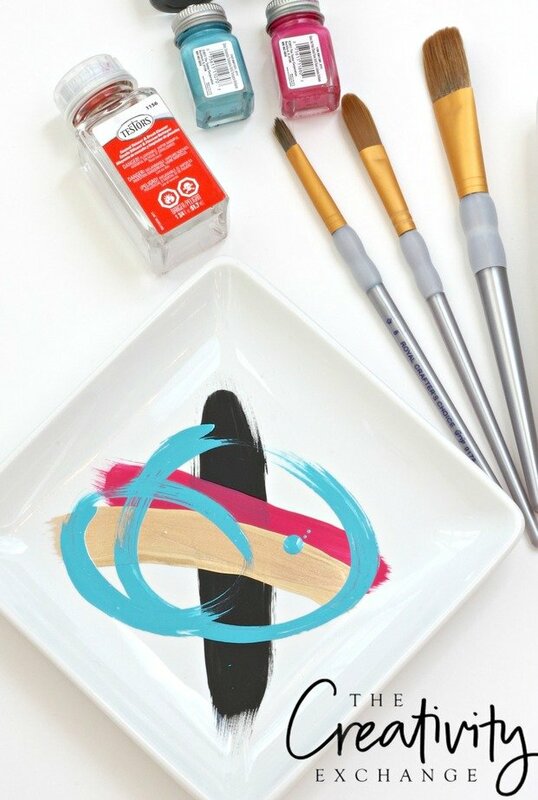 Paint swiping is meant to look messy, so if you just go fast, you can’t really mess up a meant to be messy swipe 🙂 If you feel that you have made a mistake, you can either wipe it off with paint thinner or wait until the layer dries and go over it with a new swipe. Again, you’ll want to put your painted pieces in area to dry and cure for at least 5-7 days. I know it’s a long time but you’ll see in the end results, it’s so worth it and the finish is amazing! **As a side note, these paints cannot be used on dishes that will have food. You certainly could paint the outside of a wine glass or bowl but they are not food safe for areas where food would be touching. Testor’s makes these great promotional kits with multiple starter colors in them. If you’re going to buying several basic colors, it’s a lot cheaper to buy the promotional kits here. I mixed Testor’s Magenta and Hot Pink 50/50 for my pretty pink in the images above because, for some reason, the Magenta translucent. The Hot Pink is not. The Magenta is the only color I have seen with Testor’s that is translucent. It must have something to do with model cars. Warning, Testor’s also makes acrylic paint that looks exactly the same. Be sure and read the bottle to make sure it says “enamel”. You’ll want to have very small disposable cups on hand. 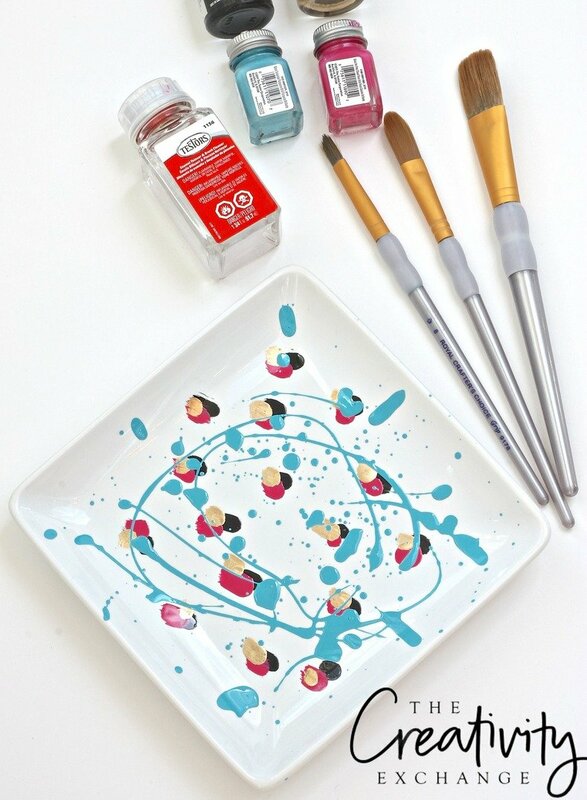 I pick up little dixie cups or dollar store plastic shot glasses for pouring out paint for the larger brushes that will not fit into the jars. 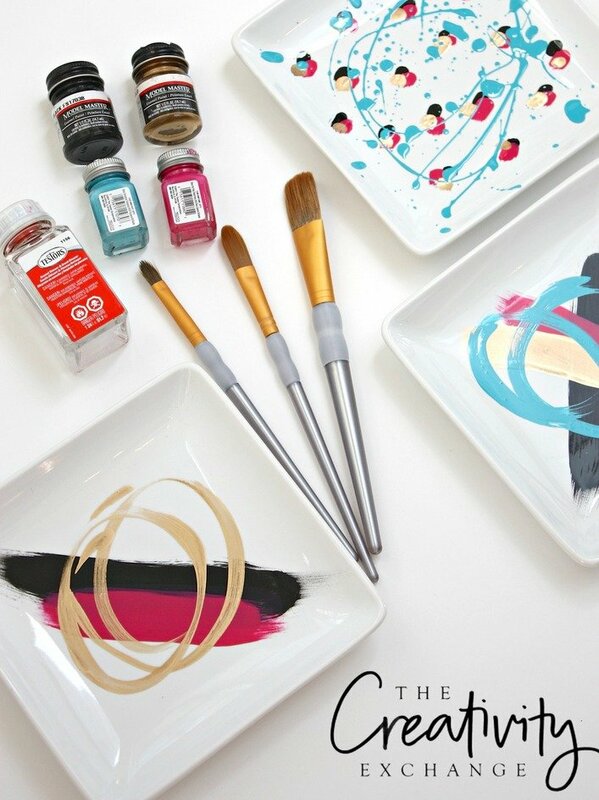 You’ll also want them for mixing colors and brush clean up. 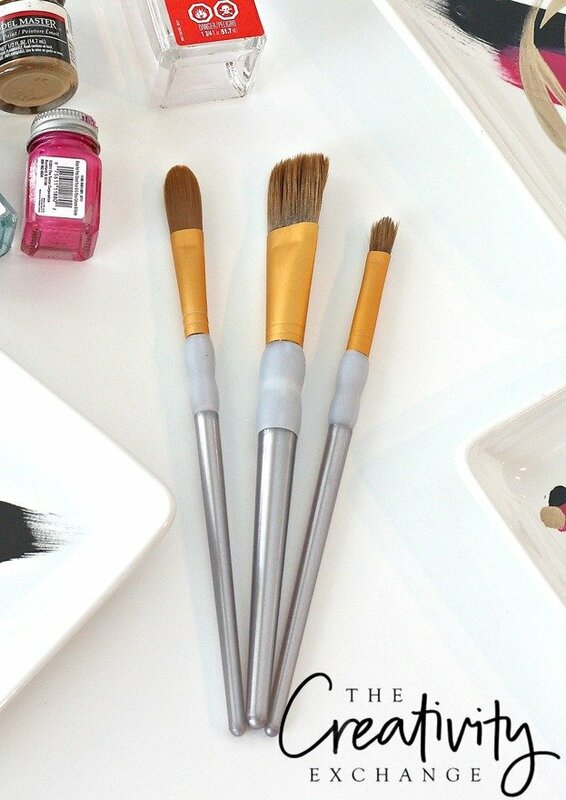 To clean your brushes, you’ll need to use the paint thinner and swish and really get them clean and it helps to wipe them a couple times with paper towel. You’ll want to only use these for enamel in the future because if you use them for acrylics, you will get hard residue that could damage your painting. I hope I have helped and inspired you in some way to pick up these awesome paints and get creative! By the way, if you have any questions, let me know and I’m always happy to answer or help. ***Amazon Affiliate links used in this post. Another type of paint to try is nail polish. I have used it for years painting on raw brass. The colors are endless and even have glitters. The prep is the is the same, but I always seal the finished pieces. I have washed and dried pieces, some many times, by accident. ( I create pins and some I forgot to take off the garment) Give it a try sometime. Hey how do you seal it? 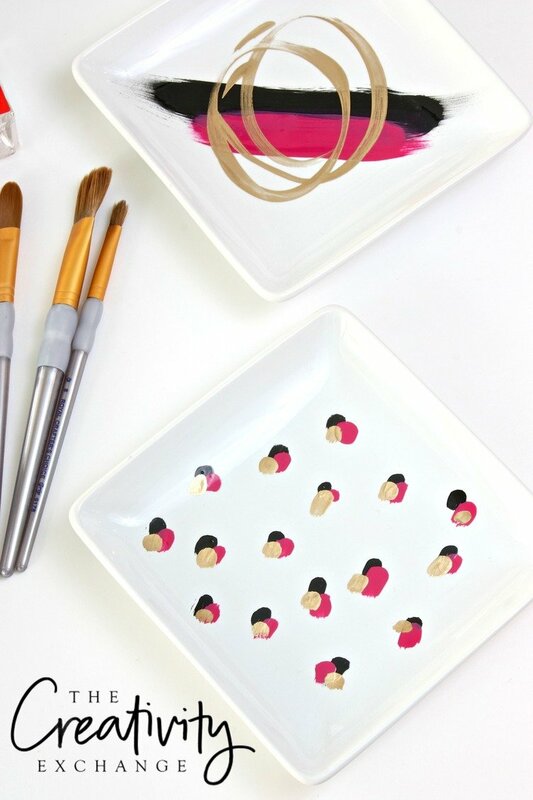 And have you tried this on ceramics? I would like to do a craft project with my newborns feet for Christmas i.e. Stamp his feet on a plate. Would this oaint be safe to use for that purpose? You know Amanda, I was thinking I wanted to do the same thing for a friend. The paint is not necessarily “safe” for that sort of thing because it is a high gloss enamel and you would have to use paint thinner to remove the paint from the feet. I want to do it as well but I think that I would probably not do it just because I think the feet can absorb toxins. I wish I had a good answer of what to use but I’m sorry Amanda, I do not. If I find an answer, I will send you a note. Thanks for stopping by. Thank you for the info. Is this paint/process dishwasher safe? ThanK you for the information. Is this paint/process dishwasher safe? What about Microwave? If i painted the outside of a mug? I would like to know the answer to this question too. I want to decorate some mugs and then make mug cakes in them for gifts. Would that be possible with this paint? I would only be painting the outside, of course. I recently changed the color scheme in my home. I have some decorative finials that are resin w red glass. Do you think this technique & paint could be used to change the red glass to another color? I would love to paint the red glass a metallic or soft blue. Yep!! That would be the perfect project for this paint! In fact, I do that type of project all of the time. Just remember, you need to let the paint dry and cure for at least 5-7 days. They also make a Testor’s enamel model airplane spray paint in the same craft section that I think would give you a smoother finish. They are little cans, so that’s all you would probably need. Good luck! Is the paint microwave friendly? And is it durable if washed frequently? Yes, it’s very durable for hand washing if it has cured. I have never put it in dishwasher, so I’m not certain. Also, I have never put in the microwave. No sealant needed since it’s enamel. Enamel takes a full two weeks to cure. Thanks! This looks like durable, smooth paint, which is perfect for ceramics! High quality paint really does make all the difference in the way your piece looks and feels after you apply it. Thanks so much for sharing the info! I’ve bought Testor paint to use on metal a while ago but haven’t gotten around to use it for jewelry. Any before and after tips when using Testor on metal? Yes, I bought one of the promotional kits of enamel paint. The reason I first bought it was that I wanted to do enamaled copper jewelry but the powders are expensive and on top of it, an oven is needed and it is expensive too. So I thought, why not? Now I need to buy the thinner and brush cleaner and I’ll be set to have fun. Cyndy: I need to paint on small surfaces on metal. It is for some pendants I make in silver. I need it to be permanent, that it won´t come off with use, as if it were enamel but without the oven process. Do you think this product will do? Or do you have another one to suggest to me? I live in Argentina, so I want to be sure it will be worth the shipping. Yes! It will work beautifully and no oven needed! You will be very impressed! Just remember that it takes a full 24-48 to dry! I want to paint red glass either pale pink or rose pink. Will this work. Will I have to mix paints or is there a spray paint of either color? The Tetor’s enamel paints work beautifully on ceramic! Just remember they need to cure and then they’ll be good to go and the paint will last! I have used Testers enamel paints on ceramics over the glazed areas to “punch up” the colors that the glaze has created. My questions is: When displayed outside in the garden, howling, (how many years), will the enamel stay intact and not chip off? So far I have many pieces that have been outside for 2 years and they look exactly the same as the day they were painted….DOES ANYONE HAVE EXPERIENCE WITH OUTDOOR CERAMIC PIECES PAINTED WITH TESTERS ENAMEL? If you wait to put them outside until the enamel has cured fully 2-3 weeks, it should last years! This enamel is crazy durable and from my experience, I have painted so many things with this paint over the years (inside and out) and years later, the paint held up beautifully! Thank you very much for this, I’m in the UK so I was wondering if this brand in particular works well, or if any oil based enamel model paint would work? I’ve checked out this brand on the UK amazon site and they are crazy money! You know Katie, I’m not sure if model enamel paint is made universally but it sure wouldn’t hurt to try one in the UK. It makes sense that it would be very close because the finish would have to be the same. If Testor’s is too expensive, I would sample another brand just to see. Good luck! What paints would you advise for glasses to be drunk from or glass plates to be eaten off of. I am a glass gilder and sign painter and have 1shot enamel sign painting paint. But was unsure as to its safety for these products… is there a sealant you can use that you’re aware off? any ideas? I sincerely think you should rethink this blog post, the paints your are advocating for are in NO WAY food safe, and yet youre telling people its just fine to put on dinnerware. These paints, the Testors brand, have a warning on the back that they are not safe for skin much less an tiem that will be in contact with food, and they even have the warning that states that they are known to cause cancer. They are great for anything that is not going to be touching food or skin, but the use you are stating is dangerous and you should seriously reconsider the information you are advocating as safe. I work at an art store and am a ceramics major from VCU, came across this in some personal research, and thought I would share my two cents. I think YOU should rethink your comments and read my whole post and my response to questions. I never ONE time advocated that it’s food safe!! Show me where I said that! I never once said it’s fine to put on dinnerware that you will eat off of. In fact, I said the contrary. In fact, my response to the last commenter was that it was not safe to use on anything that will touch your lips. 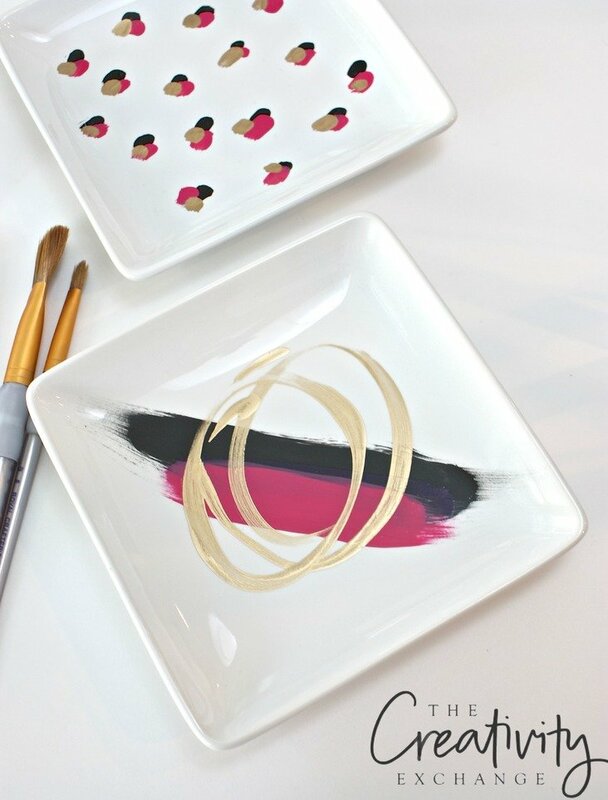 This post is for using plates for using as decorative dishes for jewelry and other stuff. Before you jump on a blog and chastise someone, at least READ the post first! Sheshh..
You definitely did say that it is not safe for dishes to be used for food. The problem I have is finding a paint that is safe to use on jewelry, which does come into contact with skin, especially earrings, necklaces, bracelets and rings. Even pins and barrettes come into contact with skin while being attached. What we don’t know is whether the paint is dangerous to touch after it is cured. Since it shouldn’t come into cntact with food, even after cured, it should definitely not be used for ANYTHING that a child might handle, since everything they pick up seems to end up on their lips. Little girls tend to put barrettes, jewelry, combs, toys into their mouths without even thinking about it and lick spills off the sides of mugs. So hard to find a safe durable, paint. I want to paint vintage jewelry items to recycle and sell, but can’t find anything safe, yet pretty. Of course nail polish just as unsafe as Testor paint and I see people paining the fingernails of children all the time. You can bet those fingers will be licked! I’m looking to paint wine bottles. How much enamel paint would I need for a full bottle? I’m not sure who far the little bottles will go. Thank you! I am an amateur at anything crafty and kind of anti-crafty! Lol! I like to play in the dirt instead…gardening. ? I do however have three metal garden decor items that I would like to repaint. They are not huge, but may require more paint than what is in these bottles. I do not want to spray paint and the small cans of Rustoleum type paint come in only four basic colours, blech! Suggestions for metal outdoor decor use, in small cans but wide range of colours? Thanks so much! does this paint need baking? I mean can I paint on already fixed terracotta floor-tile? I have a bonsai pot that needs a chipped leg/foot repaired. Now, I cannot likely match the deep green color of the pot. So my plan is to change to color of the legs/feet that support the pot…below the pot. I plan to try to achieve a deeper black green color by mixing paint. The feet of the pot are generally in the shadow of the pot anyway. Bonsai pots get wet when watered.do you think that the Testor’s paints will work for the bonsai pot feet? Yes! Testor’s enamel paint would be perfect! Just make sure you wipe off area with alcohol before you paint. Also keep in mind that it will take at least 8-10 days to completely dry/cure. But yes, Testor’s would be perfect to use and you can mix colors too! Awesome post! I actually just bought some after reading this blog for some glass jars I’m going to paint! Turns out after i told my dad i got enamel paint for my project he goes “testors?” Lol said he used it for painting model cars and such. So I guess its been around for a while. Anywhoo, I was wondering if you’ve ever used this paint on Lexan or Polycarbonate plastics and what the success is. Cant seem to find information if their enamels vs acrylics would do the job. :] Again, wonderful post! Where might one find the other paints for glass that you mentioned? The kind that needs to be baked or fired on? When painting porcelain you state let dry for 5-7 days..but only wait an hour between coats? I’m confused if I want to really make this pop with gold how will I know it’s ok to do a second coat in an hour and not have it smudge as it’s not completely cured? Should I wait a week in between coats to be safe? After an hour, the paint will be dry enough to paint over for the project I was showing to paint the paint swipes on the jewelry trays. An hour the paint would be dried to the touch and dry enough to swipe another color over the first color. However, if you’re painting something solid and want to do a second solid coat, I would wait at least 12 hours for a solid second coat. If you are using the Testor’s paints, these paints have such good coverage that you may not need a second coat. You will not need to wait a week just to paint over/second coat. The 5-7 curing is about durability. Even though paint is not cured, you can paint a second coat. I hope that helps. Yes thank you! I’ve been using testors paint for many years on plaster but not for porcelain so thank you so much for filling me in on its many uses! I got a gift for a friend got it engraved. Its really hard to read was going to try and paint the engraving black? It should work perfect! Just be sure and clean area with alcohol and wipe it dry and then paint. Remember, you’ll need time for it to cure/harden but from my experience painting everything else, this will work perfect! Will this paint hold up on plates outside? I️ am needing paints that will withstand the elements. Making garden art. If not could you recommend a paint that will? Yep! Testors enamels are great for outdoor projects. I have been so impressed with how they hold up! Is this non toxic and can this be used on cast iron pots? Unfortunately, these paints are designed to be used on anything that comes into contact with food. Do mean to say the paints “Unfortunately, these paints are not”….rather “are”? do you mean ‘are NOT designed’? So helpful. I want to use Testors enamel for confetti fitted stemless wine glasses. I’ll be using a nail fitting tool. Quick question. Do you think I should thin the paint before fitting the glasses? Or use the paint straight from the jar? Thanks! Hello, I have some pottery pieces that have been painted, glazed, and fired. Since then, they have chipped, so the raw texture of the ceramic is showing through. Will this paint work for fixing that? Does it leave a glossy finish or do you have a sealant that you can recommend? Hi! I’m painting some ring dishes as Christmas gifts this year and am using the Testor’s enamel paints. The finish is so beautiful! I’m so glad I came across your post. Thank you for tips! 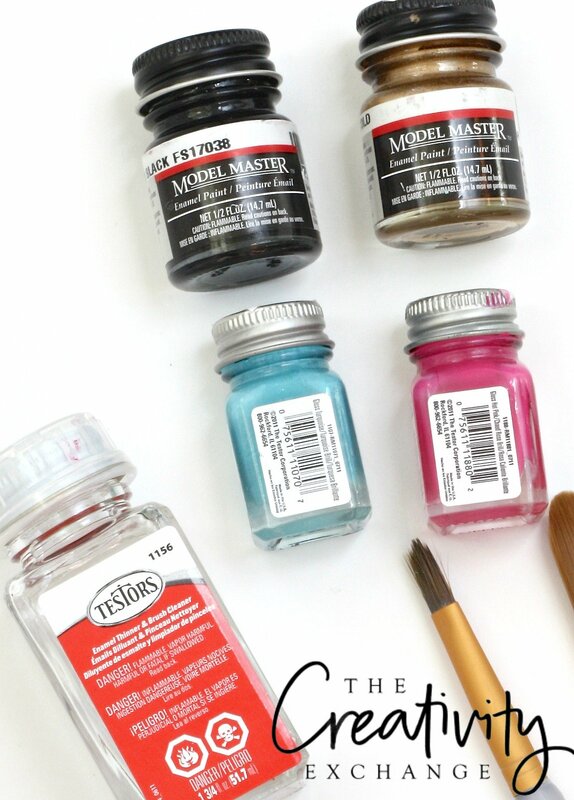 But I was wondering if you have ever used the Testors clear gloss top coat? And if you have, does it work well for longevity of the piece? I am always paranoid about how my pieces will hold up when used. I am wanting to use testors paint on tumblers if you seal it with food safe enamel will it be ok?